How do I place variables in EDS space using MPLAB® XC16? 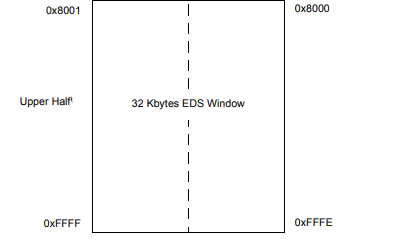 The upper 32 kB of data memory address space (0x8000-0xFFFF) is used as an Extended Data Space (EDS). The EDS includes any additional internal data memory not accessible by the lower 32 kB of data address space and any external memory accessible through enhanced PMP. EDS is organized as pages, with a single page called an EDS page (greater than 32 kB) An EDS page is selected through the Data Space Read register DSRPAG or Data Space Write register DSWPAG. To declare a variable in EDS use the space(eds) attribute. Arrays var_b and var_d are eligible for allocation in data space greater than 32 kB. The __eds__ qualifier indicates that the qualified object is in an EDS accessible memory and that the compiler should manage the registers appropriately to access this memory. The compiler will automatically manipulate the PSVPAG or DSRPAG register as appropriate. For devices that support extended data space memory, the compiler will also manipulate the DSWPAG register. For more on EDS space access, refer to the “EXTENDED DATA SPACE ACCESS” section of the “MPLAB® XC16 C Compiler User's Guide”.